Situated in this popular residential area in Chesterfield is this spacious Three Bedroomed End Town house. From the entrance hall is a wc/cloaks room. The Lounge/Dining Room has a feature fireplace with patio doors leading from the dining room into the Conservatory. The kitchen has a good range of wall and base units with integrated appliances including a fridge and freezer, electric oven and hob with plumbing and space for a washing machine. Stairs lead to the first floor with three good size bedrooms all with wood effect flooring. The modern shower room has a double shower, vanity unit with storage houses the wash hand basin, low level wc. Airing cupboard is also in the bathroom. Externally the property benefits from a front garden, garage and rear garden which is mainly paved. Holme Hall is located within close proximity to Chesterfield town centre with its own local shops. 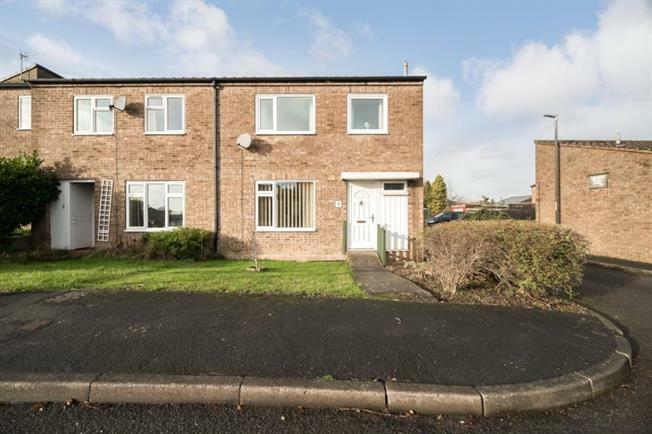 Being close to Holme Brook Valley Park, doctors and dentists surgery, local primary school. Please call to arrange an early viewing.